Castle Ravenloft impressed me with not only the incredibly smart rules, excellent components, and fun gameplay, but with its flexibility as a game system. I’m not going to go over that here, because it has been said before with electron-beam precision before (see the link at bottom of page). Suffice to say that I found it quite justifiable to commit some heinous felony in order to fund the purchase of it, if need be. It’s an exceptional, refreshing game that I thoroughly enjoy; so much so, in fact, that I just completed my painting project where I’ve spent the last week’s nights enrobing my Ravenlofties with a silky coat of luxurious Apple Barrel paints. The only other game I was compelled to do that to was Space Hulk, just for the record. In short, to quote a friend, “If you don’t like Ravenloft, you may be an idiot.” I stand by that idiom, even though I, in fact, was an idiot, at least initially. 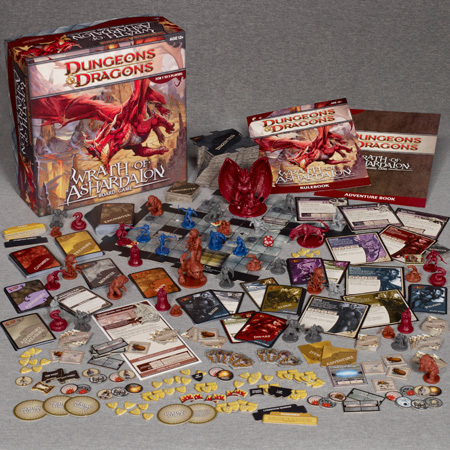 So, when a magazine I write for was offered up an advance copy of the second in the Dungeons and Dragons Board Game System family, “Wrath of Ashardalon”, I jumped on it like a man on fire jumping into a pool. It recently arrived, and not unlike a five year old child on Christmas, I tore that bad boy in a timeframe normally reserved for atomic activity. My immediate disappointment that I would again be spending the next few weeks painting Wrath figures was tempered by the fact that I would be playing Wrath that very evening with my lovely and godesslike wife. Good times, folks. Good times. While many have complained that Castle Ravenloft lacked theme, where I disagree wholeheartedly, Ashardalon goes further in almost all ways, with the exception of the dungeon tiles. 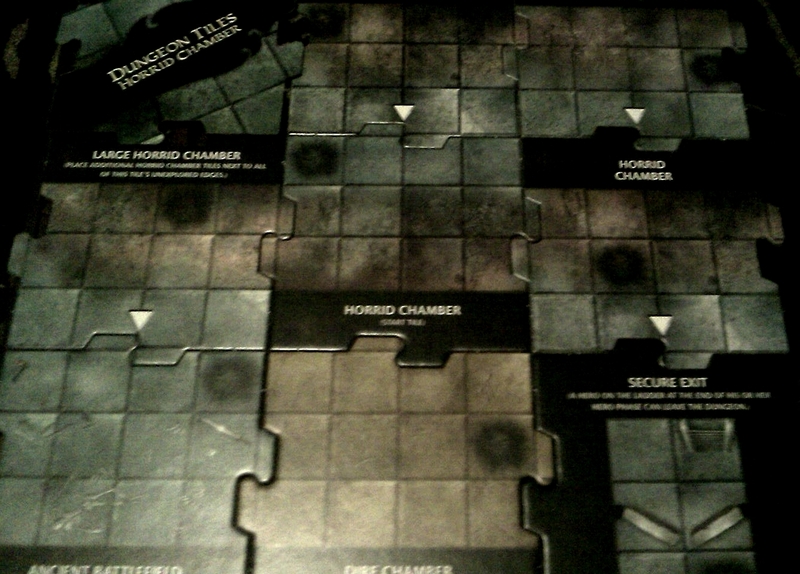 Where in Ravenloft you had many special one-tile rooms, such as the Arcane Circle, in this game there are almost all generic tiles, and some large multi-tile rooms that are combined to make large lairs such as the Horrid Chamber and Dire Chamber. That being said, they’ve added so many new mechanics to these new tiles, such as the door. These doors have special chits that are laid across the open door image on the tiles to indicate a door that is closed. In gameplay, this makes a tremendous difference in the feel to the game and the thrill of opening a door to find terrible, nightmare creatures that want nothing more than your impending doom and ruination. Then, besides the door, there’s some new chits that turn the generic tiles into useful rooms. For instance, instead of a “Chapel” tile, there’s an “Altar” marker you can place on any tile. Same with the Vast Ritual Gate, which can be used as a teleporter of sorts. Then there’s the treasure! This game now supports items that can be purchased in between adventures if you so desire. Bought, you ask? I didn’t stuttutterrr, boys and girls, I said bought. The game now has gold, jewels, and…a new car! Well, no new car, but now you can not only find useless trinkets, you can also find awesome sauce by the 55-gallon drum, such as the Crossbow of Speed, a +2 Magic Sword, and the Elven Cloak. Each of these new items are cards in the Treasure deck versus the Adventure Treasure deck as they might’ve been in Ravenloft. Further, each has a gold value listed on the card for purchasing between, or before, adventures. This only builds on the open system that Ravenloft began, and I, for one, welcome my Dragon masters. Cracking the box open, you’ll find five new Heroes to play, a Dragonborn Wizard, a Human Cleric, an Elf Paladin, a Half-Orc Rogue, and a Dwarf fighter. These are actually cooler than the Ravenloft figures, and their Power cards are more clearly written, especially regarding the Cleric. Next, delving further into the box, are 13 sheets of Ashardalony goodness, loaded with new stuff such as new, improved treasure tokens and markers, new traps such as the Poison Dart Trap and Lava Flow Trap, and a great many other markers and chits. There’s even new effects, Poisoned and Dazed, which can happen if you ingest some bad mushrooms or if your Hero is hit by certain creature or trap types. There’s also a bunch of monster markers, similar to Ravenloft’s generic ones, but these all are specific to the kinds of boss monsters that come in this set, so you can literally pre-load rooms with monsters to create theme and narrative whilst crafting your sinister adventures. There’s also the new “toolkit” stuff, such as a shield marker, markers that you can place in-game as effects, such as caltrops, walls of blades, and other powers, and then on top of those, there’s villager markers, gold/treasure markers, and a variety of other items and bits to implement in your own adventures or to use with the existing 13 adventures in the Adventure book. Finally, there’s a crapload of new miniatures that are far more varied than in Ravenloft. 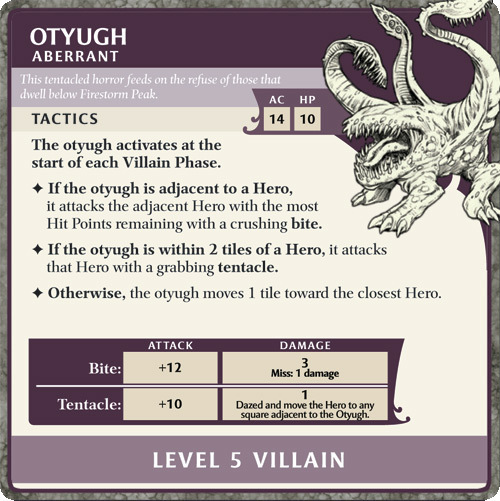 There’s a big red Dragon, which was to be expected, but now there’s a lot more interesting critters to slay with no regard for their litter of demon spawn, such as the ever-beloved Beholder and the Otyugh, which is the equivalent of how many perceive their Mother-In-Law to be. There’s an Orc Shaman, a Drake that gets more powerful as you beat on it, a Kobold Dragonlord, and all kinds of other nasties. All in all I am very impressed with the collection of stuff in the box, and they went above and beyond my expectations with all this new stuff. When you combine all this stuff with the Ravenloft stuff, you’re talking about being able to craft amazingly deep, narrative, complex adventures and campaigns that will keep you entertained for years. To top it all off, Wizards just announced a third sister to these tantalizing twins, The Legend of Drizzt, so we’re talking about nearly 140 figures, 30+ sheets of tiles, and more cards than a poker room at the Mandalay Bay. I simply could not be more excited about the epic Dungeon Crawling that I will be doing in 2011, and that’s a fact. Now to the really new stuff that makes this so much better than its predecessor: the new decks. Besides the normal Encounters, now you have Hazards, which are persistent effects that, like Traps, cause bad things to happen to you, but can’t be disarmed. Then you have Curses, which are semipermanent effects that happen to the player’s Hero when pulled and last, generally, until you pass a die roll check or kill something. These are nasty as hell, and are simply no fun when you pull them. Next, there’s the purple-backed Adventure cards, which act as an AI for Non-Player Characters in the game, so you can account for guiding them through a dungeon or out of a dungeon, depending on the scenario. This is the single most awesome thing that has been developed for this system because it allows you to create far more interesting scenarios than you ever could with Ravenloft, and that’s saying a lot. Moving on, there’s the Boon cards, which are a neat new type, although there’s only six of them. These cards are given at varying times, in a scripted manner, when the players do something amazing, like killing a major menace to society. These allow you to skip pulling certain types of monsters and draw new tiles without monsters. Not a real…boon…to the game, but I can see them being useful to dungeoneers who wish to create a campaign. Finally, there’s the Chamber cards. 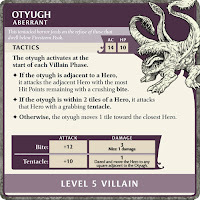 These cards essentially allow for scripted, interesting adventures because they give specific instructions regarding tiles and monsters to place, and furthermore, give you what I can only describe as objectives. Essentially, when you pull a “Chamber Tile” which is specially marked on the back, you must draw from the Chamber Deck. This then scripts the final showdown’s events, how to place the monsters, and what you’re looking to do. This new mechanic is a godsend for those who wish to make cool, compelling adventures without having to put in a ton of effort. Now that you know what kinds of happy stuff is in the box, let’s look at how the game plays. I’m into Wrath of Ashardalon 5 adventures deep now, and I’ve already got the wheels churning on how I’m going to build my next Campaign for this awesome game system. This plays almost identically to Ravenloft, so there’s not a lot of new learning you’re going to have to do if you want to jump into this, but if you, like me, were a Ravenloft Denier, then you definitely want to get Ravenloft before it goes out of print. Anyhow, enough about my aspirations and onto the game. The idea of the game is that one to five adventurers has to romp through a dragon-infested cavern system, hunting the King Dragon, Ashardalon, while saving villagers, recovering artifacts, helping a little person find his gear, or my favorite, laying waste to an entire room because it’s “mysterious”. Essentially, each turn you will be asked to explore a new tile when you’re at a tile’s edge, which boils down to placing a new tile and drawing a new monster to inhabit that tile, or potentially having an Encounter, which means drawing an Encounter card and resolving the effect. This game is just as nasty as its predecessor, and all manner of bad things will happen to you. Gameplay is the same in virtually every way to Ravenloft, so I won’t belabor the specifics on how to play. I invite you to look at my Castle Ravenloft review, in which I detail how to play, and the link is at the bottom of this page. The long and short is that the monster AI system in this system is so profoundly good that I hope to see it mimicked in the future by all other Dungeon Games. The fact that there is no single person to play against, or to “run” the game, is what I believe makes this an incredibly enjoyable experience. All the players must work together to accomplish the objective-based missions or all players will fail. One of the key aspects to this game is that teamwork is absolutely required since if one Hero falls in battle, all Heroes lose the game. Combat is both card- and dice- based, with each character having Powers to play, some of which are persistently available and some that are one-time use, and the combat is resolved by a dice roll. If your roll, plus bonuses, are equal or greater than the enemy’s armor rating, well, he’s going to get smacked. The damage and/or effects caused by the weapons or spells are constant, and are printed on the card, so if you do hit, you’re more than likely going to do damage to the monster. Some found or bought items help with either the damage you do, the chance to hit, or both, and these are mountains and oceans better than the Ravenloft items, as I noted before. Another note about the game is that it has some backward- and future- compatibility built into it. 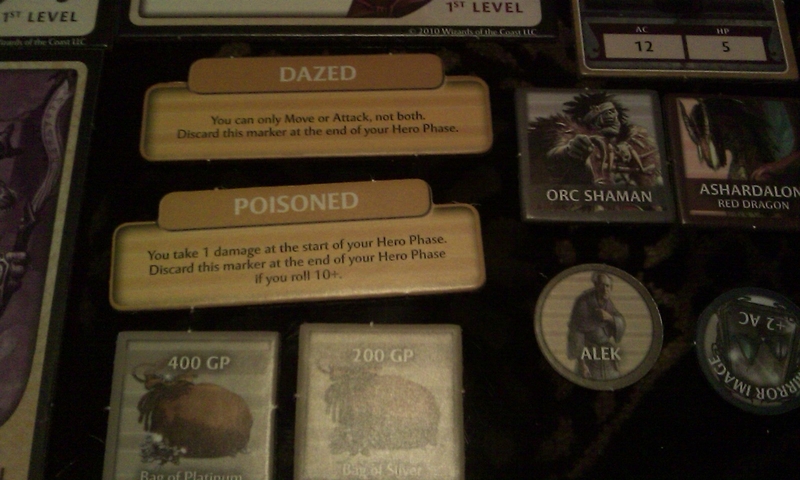 Three of the Power cards for the Heroes are now “Racial Powers”, meaning that you can use the Dragonborn’s “Hurled Breath” Utility Power on Ravenloft’s Dragonborn Fighter, you can use the Dwarf’s “Dwarven Resiliance” Utility Power on Ravenloft’s Dwarf Cleric, and finally, you can use the Half-Orc’s “Furious Assault” Daily Power in any future expansion’s Half-Orcs. This means that the entire game system is now, truly, tied together by racial powers. Very exciting, indeed! 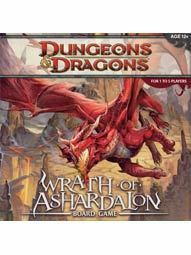 The long and short on Wrath of Ashardalon is that it’s everything that I hoped it would be, and more. It fixes all but one of the things that I disliked about Ravenloft, which were the prepainted miniatures, and it absolutely does everything that I loved about Ravenloft better. Standing on its own, I have to say that it is a better buy than Ravenloft, but that being said, once you play this, you’re going to want Ravenloft too. I hate to say it, but I even like this better than my Holy Grail Game, Dungeons and Dragons Fantasy Adventure Boardgame, in all aspects other than the fact that game had so many awesome dice to toss. This is just a better game than any other Dungeon Crawl system that I’ve played, be it Dungeonquest, Warhammer Quest, Clastrophobia, Heroquest, Dragon Strike, Tomb, and especially the expensive and bloated Descent. This does everything I want it to, and nothing I don’t. Just a great, wicked great game, guys. What more can I say. If you don’t like Ravenloft, you may not like this, because the two games are a lot alike. That being said, it’s deeper, both thematically and strategically, and the game is just downright fun to play. Those who found Ravenloft too shallow, I maintain, are not seeing it for what it is: a game system that allows you to not only play what’s been printed in the book, but that allows you to create epic adventures on a grand scale if you so desire. If you want a game where you need no thought or creativity, try Container; I hear it’s a hoot. If you want to slash and incinerate fiends and fell beasts until your boots are soaked to the knees with blood of differing shades, then Wrath of Ashardalon is what you’re looking for. Ravenloft is a ton of fun, and now that I’ve played Wrath more I think I like the monsters and theme of Ravenloft a bit better. I guess I have a soft spot for things that go bump in the night. Still, Wrath offers a lot that Ravenloft doesn’t, and from a gameplay standpoint…very friggin cool. 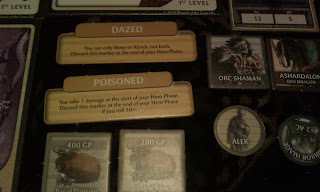 I am really hoping the D and D line only gets better; I can’t wait to see how the Drizzt game comes out.